G. John Ikenberry , Michael Mastanduno, and William C. Wohlforth demonstrate in their article “Unipolarity, State Behavior, and Systemic Consequences” that other states rival the U.S. in one area or another, but “the multifaceted character of American power places it in a category of its own… What makes the global system unipolar is the distinctive distribution of material resources.” Given the above definition’s specification that the hegemon often establishes and enforces the rules and norms in the international system, the question becomes: to what ends and in what situations should we devote our national energies and all of our advantages towards assisting countries in need? “…There is some positive relationship between a state’s relative capability to help or harm others and its ability to get them to do what it wants,” Ikenberry, Mastanduno, and Wohlforth argue. “Even if the relationship is complex, more capabilities relative to others ought to translate generally into more power and influence.” This being true, isn’t our job as the world’s hegemonic power defined by our ability to at least try to keep our fellow countries conflict free? As the world’s most powerful country–a title that took us 45 years of fighting with Russia to attain–isn’t it irresponsible not to intervene in some way? Speaking specifically on the Syrian conflict, Samantha Power believes that a lack of U.S. action signals to North Korea and Iran that the international community is willing to tolerate the use of weapons of mass destruction. That’s how much the actions of the United States, as hegemon, matter. ‘There were some talks about it,’ Rouhani said to Amanpour through a translator. ‘And preparation for the work was done a bit as well.’ Tiring WorK: Iranian President Hassan Rouhani addresses the 68th United Nations General Assembly at UN headquarters in New York, September 24, 2013 First Address: Iranian President Hassan Rouhani addresses the 68th United Nations General Assembly at UN headquarters in New York, September 24, 2013 ‘The United States declared its interest in having such a meeting, and in principle Iran could have under certain circumstances allowed for it to happen,’ he said. ‘But I believe we didn’t have sufficient time to really coordinate the meeting to the full extent that we needed to.’ According to CNN, the meeting was on-track but was postponed because it would have been ‘too complicated’ domestically for the new Iranian leader. However, Rouhani claimed that he had full autonomy on conducting negotiations with the West and that he was operating with the full backing of Iran’s supreme leader, Ayatollah Ali Khamenei. ‘The supreme leader of Iran has said that should negotiations be necessary for the national interest of the country, he is in fact not opposed to it,’ said Rouhani to Amanpour. And in a revealing segment, he seemed to concede that the Holocaust did indeed occur, which is in stark contrast to his Ahmadinejad, who has in the past spoken of his desire to ‘destroy’ the state of Israel. ‘I have said before that I am not a historian, and that when it comes to speaking of the dimensions of the Holocaust it is the historians that should reflect on it,’ Rouhani told Amanpour. 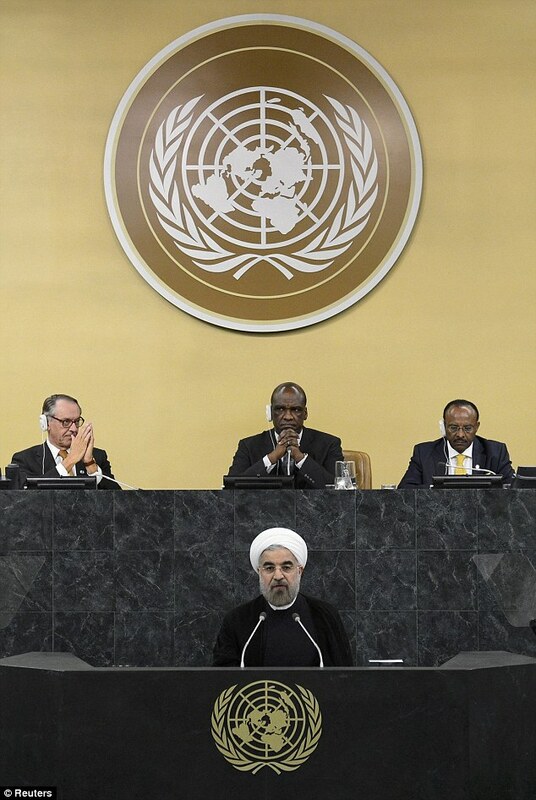 ‘But in general I can tell you that any crime that happens in history against humanity, including the crime the Nazis committed towards the Jews, as well as non-Jewish people, was reprehensible and condemnable as far as we are concerned.’ Message to the World: Iranian President Hasan Rouhani speaks during the 68th session of the General Assembly at United Nations headquarters, Tuesday, Sept. 24, 2013 Earlier in the day President Obama cautiously embraced overtures from Iran’s new president as the basis for a possible nuclear deal, but a failed effort to arrange a simple handshake between the two leaders underscored entrenched distrust that will be hard to overcome. In a speech to the United Nations, Obama said he was determined to test President Hassan Rouhani’s recent diplomatic gestures and challenged him to take concrete steps toward resolving Iran’s long-running nuclear dispute with the West. Hours later, Rouhani used his debut at the world body to pledge Iran’s willingness to engage immediately in ‘time-bound’ talks on the nuclear issue but he offered no new concessions and repeated many of Iran’s grievances against the United States, and Washington’s key Middle East ally, Israel. A senior U.S. He also admitted that he had failed to mention this second encounter during his trial testimony. On cross-examination, RosarioOtero sought to demonstrate inconsistencies between William’s trial testimony and his testimony at resentencing. In particular, he noted how William’s testimony had become more specific in a number of respects since trial. William had been unsure about the various colors of drug caps at trial, yet exhibited no such hesitancy at resentencing. Moreover, at trial he had testified to having seen RosarioOtero at Apartment 50 at least two times, yet at resentencing he revised that estimate to [s]everal times a week. William was the only witness at the resentencing hearing. At the conclusion of his testimony, RosarioOtero asked to call Agent Cristobal Rodriguez. Agent Rodriguez had previously interviewed William during the investigation of the Los Dementes organization, and RosarioOtero hoped that Agent Rodriguez could show how William’s testimony had changed over time. However, RosarioOtero had not subpoenaed Agent Rodriguez and the district court refused to continue the proceedings in order to bring him in. RosarioOtero’s counsel argued that the shifting substance of William’s testimony raised an unforeseen necessity, but the court determined that William’s testimony contained the same or musical variations of the same testimony that he had offered at trial. The district court further found William’s testimony credible. The court, making a conservative measure of the amount of cocaine attributable to RosarioOtero, concluded that RosarioOtero could have foreseen the possession and distribution of 5 to 15 kilograms of cocaine, and imposed a sentence of 151 months’ incarceration and 10 years’ supervised release, which matched the original sentence. This appeal followed. II.